This article’s purpose is to provide step by step procedures on cleaning granite flooring in a commercial building. We will also outline where does granite come from and a new innovation that is green and will deep clean granite and all stone floors easily while producing incredible cleaning results. Also listed in this article are chemicals, tools and supplies to achieve great clean results. The following cleaning procedures are a guide line and for the most part can be applied for cleaning granite floors in residences. The interesting aspect of granite floors, if know how to clean and maintain terrazzo, marble, travertine and other quarried stone flooring, you basically know how to clean and maintain granite floors. It can be cleaned with water based cleaners and can but does not have to be coated with a floor finish (wax) or seal. The choice is up to the person’s personal preference. If the granite floor has been coated with a floor finish, wax, polish or sealer, the Daily cleaning procedure would be the same with the exception of using a general purpose floor cleaner as the cleaning agent. Cleaning Granite Flooring – What is a Granite Floor? It is a mined from the Earth and is used in commercial and residential locations for flooring, walls, and countertops as well as for monuments, statues, etc. Geologists are mixed on how granite is formed. Some believe that the granite is a result of incredible pressure over eons that transform many minerals including different categories of feldspars, quartz, garnet, etc. into granite rock. The other thought is granite is a result from volcanic magma that undergoes crystalline fracturing (division or break up) to form granite. 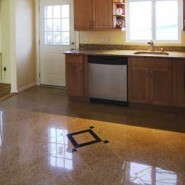 Granite is a great stone for flooring because it is one of the hardest stones available on the market. 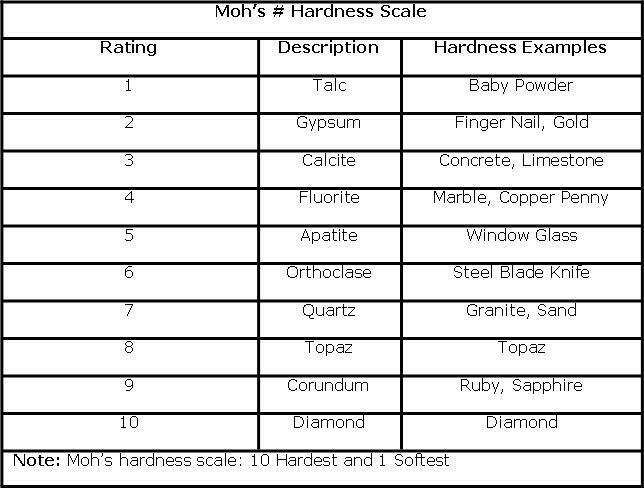 See Moh’s Hardness Chart below. So, it stands up well to foot traffic and is durable and resistant to stains, spills and soils. However with that said, all spills should be cleaned as soon as possible. It comes in a variety of colors and can be polished to a high gloss or left with a matte finish. It can be sealed with a floor finish or polish or left natural. It can be ground smooth or left rough and uneven for different appearances. So it is beautiful, easy to keep clean and versatile. Set up: Wet Floor Signs or Barricade area being cleaned with Caution Tape. If entrance matting is removable, unload soil from entrance matting. If not, utilize a dry vacuum procedure to remove the loose soil from the matting. Dry Cleaning: Dust mop floor with untreated dust mop to remove most of the surface dust. However, if microfiber dust mops are available, they are the recommended tool for this procedure. Remove gum and other debris adhered to the floor with a Blunt Plastic Scraper. Manual Cleaning: Damp mop entire floor using a mop and bucket method. Best practice would be if using a mop to use a quality microfiber flat mop system. A quality microfiber system will deliver high performance results with this cleaning procedure. Use professional grade Stone or Granite Floor Cleaner according to label directions. Remove black marks and scuffs with light duty white pad or tennis ball.New Innovation: The “That’s Amazing” Cleaning Pad; a special laminated pad that fits on a doodlebug holder designed to manually scrubs deep into the pores of the floor and penetrates soils easily. Inspect floor after it has dried. Remove wet floor signs after the floor has been thoroughly dry. Mix a professional grade Granite cleaner according to label directions and clear potable water in the automatic scrubber’s solution tank. Using the automatic scrubber equipped with red, white or the “That’s Amazing” Floor Cleaning Pad and clear potable water in the solution tank; make one single pass with the automatic scrubber, with floor pads down, solution valve half-open, squeegee down and vacuum on, pick-up the solution thoroughly. New Innovation: The “That’s Amazing” Cleaning Pad; a special laminated pad that fits automatic scrubs and single disc swing machines. They come in three sizes; 13”, 17” and 20”. When used with power floor machines, The “That’s Amazing” Floor Cleaning Pad scrubs deep into the pores of the floor and penetrates soils easily. Inspect floor after it has dried. Remove wet floor signs after the floor has been thoroughly dry. It is recommended that commercial buildings use commercial grade granite and/or stone cleaners, tools and equipment. Best practices include the following. Safety Equipment: Wet Floor Signs, Gloves, Goggles, boots, etc.